AMD’s next generation family of enthusiast Ryzen 2000 series CPUs is less than a couple of months away. The new chips will come in configurations of up to 8 cores and 16 threads, just like their predecessors. However, they will feature GlobalFoundries’ brand new 12nm+ manufacturing process and enhanced Zen+ CPU cores. The new chips will also run at higher clock speeds than their predecessors and are expected to support significantly faster DDR4 RAM kits of up to 4000MHz. The new chips will officially be released in April, although you won’t have to wait until then to get a taste of what the new chips will bring in terms of memory, CPU frequency and IPC improvements. AMD’s senior technical marketing CPU lead James Prior confirmed in an earlier interview with OverclockersUK that the company’s newly introduced 2000G series Raven Ridge Ryzen APU lineup features some of the same improvements expected with the upcoming Pinnacle Ridge Ryzen 2000 series CPUs. One notable difference however is that the APU parts aren’t soldered to the heatspreader like their CPU siblings. 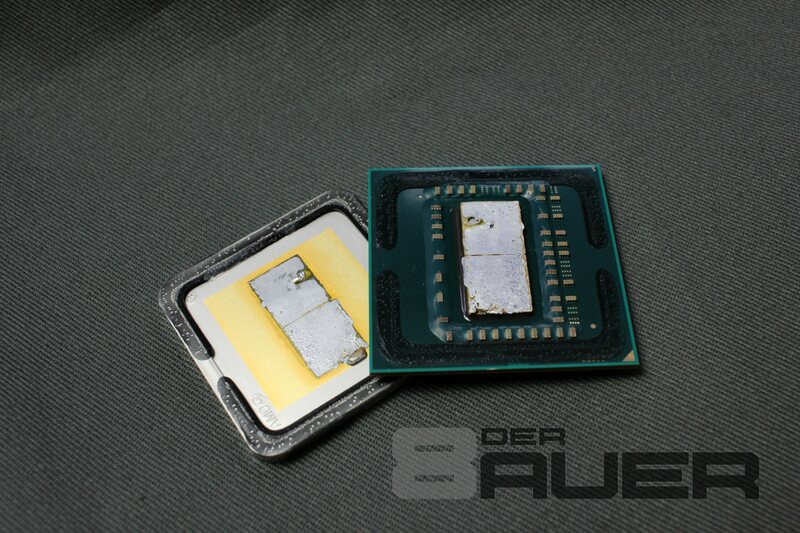 Rather they rely on a thermal interface material, also known as TIM, something that Intel has been highly criticized for in the past due to the inherent cooling disadvantages associated with the use of TIM in place of solder. Especially a high quality Indium and Gold solder like we’ve seen on AMD’s first generation Ryzen parts, which can reduce temperatures by up to 25c compared to a standard TIM solution. While we certainly favor a soldered IHS over TIM any day of the week, it’s understandable why AMD has opted for the less expensive solution for its APUs. The thinner profit margins of the lower end and mid-range segments of the market where APUs exist today simply leave little room for luxuries like a high quality solder. Fear not however, according to AMD’s Robert Hallock, second generation Ryzen CPUs will make use of solder instead of TIM. A high quality solder job is measurably more expensive than a TIM solution, hence why it makes sense to reserve it for high-end products such as the upcoming 2nd generation Ryzen CPU parts.